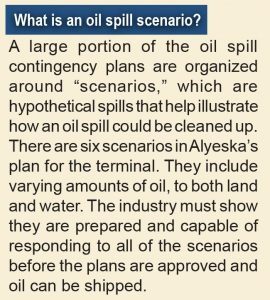 In October, the Alaska Department of Environmental Conservation, or ADEC, approved an amendment to Alyeska’s contingency plan for oil spills from the Valdez Marine Terminal. One of the major changes incorporates new oleophilic oil skimmers, which will also be on the soon-to-arrive Edison Chouest barges, into the plan. These skimmers, along with the Current Buster booming system, make up a more advanced oil recovery system. The new system allows responders to operate and collect oil for longer periods, as less water is collected requiring less storage. Detailed descriptions of training programs for responders remain in the plan. The amendment originally proposed by Alyeska in March removed some of these details. The Council, in comments submitted in April, promoted keeping such details in the plan. ADEC agreed, with updates to the descriptions. The amendment also updated “Scenario 4,” a theoretical spill of 59,000 barrels, or almost 2.5 million gallons. A sensitive area protection decision matrix was replaced with a new one. The matrix is a tool that helps responders decide if oil spill boom should be immediately deployed to protect Solomon Gulch Hatchery and the Valdez Duck Flats, two sensitive areas close to the terminal. The hatchery releases 240 million pink and coho salmon fry and smolt annually to enhance the commercial and sport fisheries of Prince William Sound. The duck flats, a highly productive biological area, provides important habitat for water birds, fish and other estuarine and intertidal species. The hatchery and duck flats are located approximately two and three miles from the terminal, respectively. A multi-stakeholder group developed the original matrix in 1997 after the tanker Eastern Lion spilled 8,400 gallons while loading at the terminal in 1994. Oil reached the hatchery in 18 hours and the flats in 36 hours. The new matrix may no longer indicate that booming is immediately necessary for significant oil spills in these two sensitive areas. 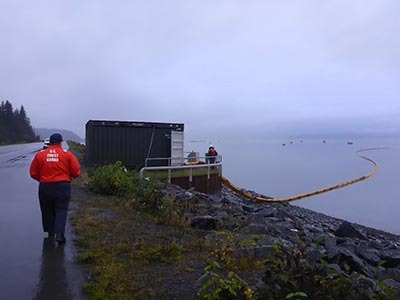 The U.S. Coast Guard oversees the deployment of boom for the Solomon Gulch Hatchery after a spill from the terminal last September. Boom deployment can take 10-12 hours or longer, so a decision whether to use the boom must be made very early in a spill response. In November, the Council, the City of Valdez, and Prince William Sound Aquaculture Corporation, requested an adjudicatory hearing with ADEC to reinstate the original matrix. This hearing, which has been granted, is an administrative procedure, spelled out in state regulations, to appeal a decision to ADEC’s commissioner. “Alyeska is required to have enough resources available for containing, controlling and cleaning up a spill at the source and protecting multiple environmentally sensitive sites in the area,” Schantz said. Safe oil transportation: Are we really so far apart?